Since some time I felt the need to use a sustain pedal with the MIDI controller I use for recording music. My aging Roland controller never had a problem with a simple ‘Hold’ function, but ‘Sustain’ proved to be to difficult. Some time ago I ordered a B-stock Arturia Keylab, but the quality was so bad I had to return it (which had obviously nothing to with Arturia, but everything with the music shop that send out a product without proper quality control). Some time ago I started reading things about the Komplete Kontrol so that controller had my attention. 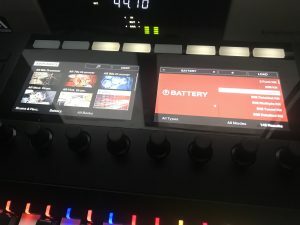 There were a few things that made me wary about the Komplete Kontrol. First of all it looked overdone with the two screens and the impressive set of lights and buttons. Most of all I was afraid that I was buying a potential great product but that when actively using it you run into all kind of problems with incompatible (third party) software. So I might as well have bought a simple MIDI controller. In my opinion Native Instruments makes great software, but its user friendliness and ease of use I do not consider as its greatest features. Anyway, I took the plunge and bought the 49-key model. Without any doubt from a physical standpoint you can easily see you are dealing with a quality product: the bender. modulation wheel, knobs and buttons breathe quality. The resolution of the two screens do not have an exciting resolution, think early type iPhone. Of course it would be very nice if a future iteration of the Kontrol would see a touch screen for an even more direct way to interact. Also the Kontrol editor for Mac was not “made for Retina”, now I come to think of it I believe none of Native Instrument’s software is. The software installation procedure is simple. In the box with the keyboard you will find a serial that needs to be added in the Native Access software. After that you will be presented with the Kontrol Editor and some -impressive- free additional software like Massive and DrumLab. Through the mail I also received 2 vouchers each worth 25 euro giving you the possibility to buy additional software in the Native Instruments online shop. After installing the Kontrol editor with its first time use the Kontrol editor scans your PC/Mac for compatible software using the so called NKS format that Native Instruments use to interface with the Komplete Kontrol. It worked flawless with my Arturia software. My Waves software needed a small update and then was flawlessly recognised by Kontrol editor. 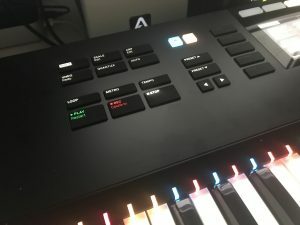 The Kontrol is compatible with my DAW (Logic Pro X) but there is a ‘but’. Logic Pro X works smooth with all the control like functions (transport, mixer settings) but it does not support Logic’s plug-ins and effects unfortunately. It would be a great addition if this would become available in the future. The way it works within a DAW is as follows: you load a Kontrol instrument on a (in my case Logic) track and from there you build up the instruments and effects of choice. So within one Kontrol track you can have a chain of instruments and effects, for example Arturia JUP-8V, Klangheim Compressor and Waves H-Delay. You can choose to make all the settings on your computer screen or on the Kontrol itself, the last option of course being one of the main reasons you bought this controller anyways… Because the number of settings within an instrument or effect can be quite overwhelming you might need to click your way through different screens on the Kontrol to get to the parameter you want to edit in one of the two screens. 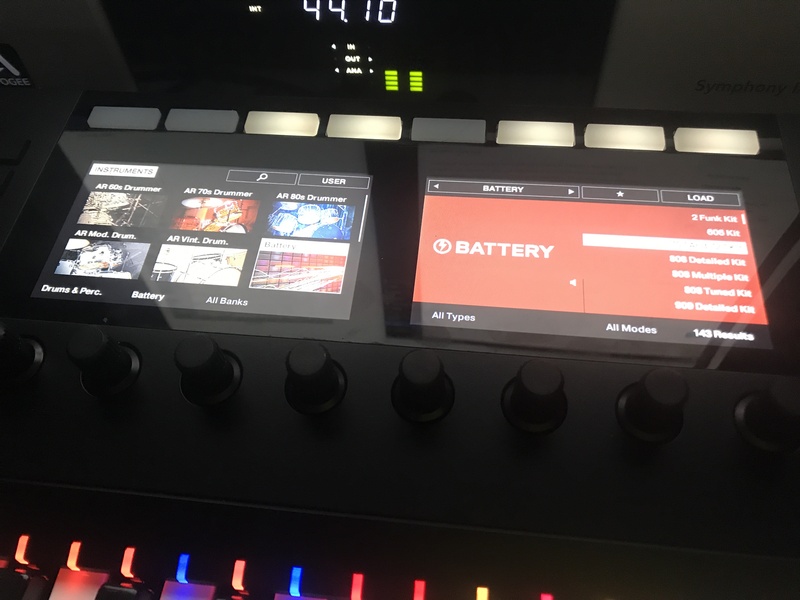 This can be a bit cumbersome procedure, because the description of the parameters is similar to when you change the viewing Logic’s plug-in window to the Control Editor. Things (the naming of parameters) can be a bit cryptic and it is handy that when you are not sure which parameter you are editing to keep an eye on the computer screen to be sure you are editing the right one. Where the Kontrol absolutely shines is the way you can super easily choose an instrument of your liking. First you can narrow down your search to the type of instruments (for example ‘Sampled Instruments’ or ‘Drums/Percussion’) and from there you can search foryour instruments and favourite patch. Scrolling through the patches automatically plays something for you, so you don’t even have to worry about pressing keys on the keyboard. Only if you really want to use a patch, you push the Load button. This functionality alone is worth the price of this controller. For every note there is a little light above the keybed. At first this looked a bit like overkill to me, but when I loaded my first drum instrument it became clear why this is a great idea. Similar instruments have same lights, all Snare drums for example are yellow and all Hihat related instruments have a blue light. This is very handy while software developers of drums software put sounds at more or less random places and now it suddenly becomes clear where the different types of similar sounds are positioned. It is the same functionality that you can see in Kontakt with the keyboard screen and its colorising to indicate the function of the key. I had my reservations if all Kontrol features should work as advertised. This is absolutely the case. For a company that is known to produce some quite complicated software this is a simple to understand and well working product. The big advantage is in my opinion is the ease to drill down to the instrument and accompanying patch of choice. Putting instruments and effects in a row contributes to more creativity and experimentation than using the computer screen of your DAW. Because working with a mouse is always somewhat cumbersome within a DAW you are more likely to go for the combinations of instruments and effects that you know. I felt that with he Kontrol makes you more willing to experiment. Once you have reached your desired instrument/patch the editing of parameters is less spectacular, yet still preferable compared to mousing on the computer screen. The instrument itself is clearly build with high quality components, so this should give you a long and trouble free experience when making music. This entry was posted in Music and tagged komplete kontrol, native instruments on May 3, 2018 by Ewald Kegel.